Printed signature of Eamon de Valera (spelt phonetically in Irish as “de Bhailéara”). 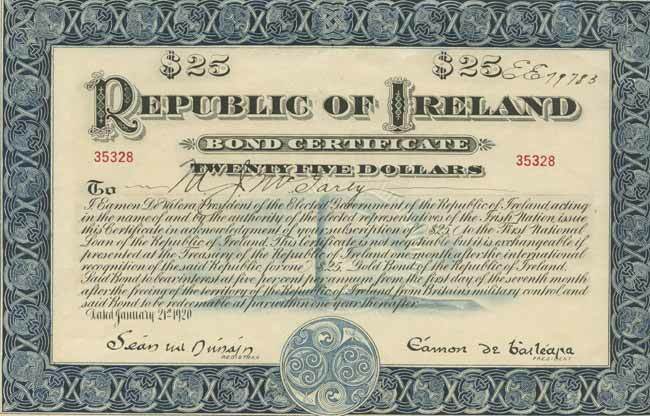 These bonds were issued to raise funds for Dáil Éireann during the Irish War of Independence. Specimens of the bonds are unusual. De Valera bond. 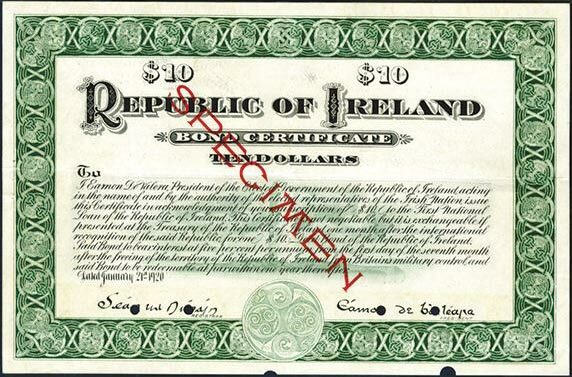 Republic of Ireland Bond Certificate Ten Dollars. Éamon de Valera, the president of the first Dáil, made a tour to the US in 1919. Whilst on this tour, over five million dollars was raised through the sale of these republican bonds. However, he found himself on the losing side of the Irish Civil War which followed immediately after the end of the War of Independence in 1921, and a dispute arose regarding ownership of the money raised from the republican bonds in the US. De Valera claimed the funds on behalf of his party. The government of the Irish Free State, under President William T. Cosgrave, also claimed the funds. The Irish High Court gave half the funds to the Irish government, and the other half of the funds remained on deposit in New York. In 1927, the New York Supreme Court ordered that the balance of the funds be returned to the original subscribers. 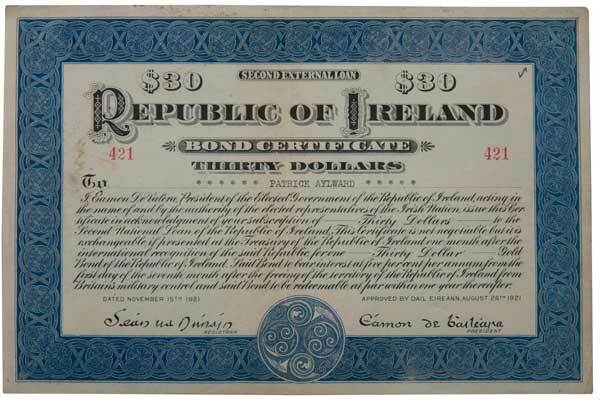 Several nice examples of these bonds have turned up in auction lately in Whytes, and other auction houses. Interesting background to the issue of these bonds. Several denominations were issued, some of which are seldom seen. Here is an example of an issued $25 bond. What are the other denominations of this series? I've seen pictures of the Fenian bonds up to 500 dollars. I have seen reference to the following denominations: $10, $25, $50, $100, $250, $500, $1000, $5000 and $10,000. I wonder how many 10.000s they sold! Have you any images of some of the higher denominations? ... and here's one for you - anyone ever come across a $30 bond before? According to this, it looks like there was at least one further issuance after the original Jan. 21st 1920 issue - notice the issue date and the "Second External Loan" tag. The $30 has a very low number, it might have been a small issue. 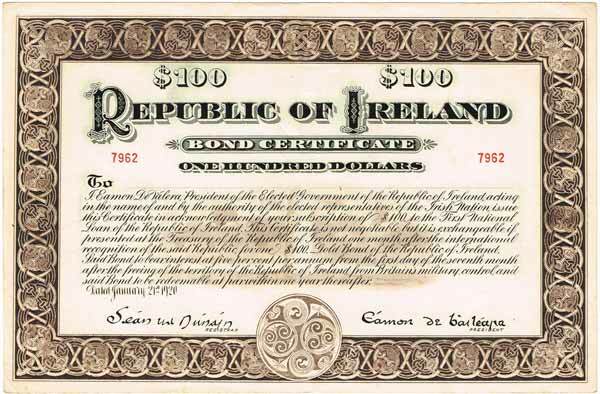 Here is a $1,000 bond of the second type, 'Approved by Dail Eireann'. Wow - a lot of money in 1921! I guess there ought to be specimens of the $5,000 and $10,000 somewhere. I can't imagine they would have sold too many of them! I'd say you're correct in your assumption there. Genuine unissued bonds though might not have the embossed stamp, I don't know.